Honest Abe, Old Hickory, His Accidency, Old Rough and Ready, Cool Cal, and Handsome Frank are but a few fond (or not so fond) nicknames bestowed upon U.S. presidents. Though rarely officially endorsed or assigned, these names stuck. 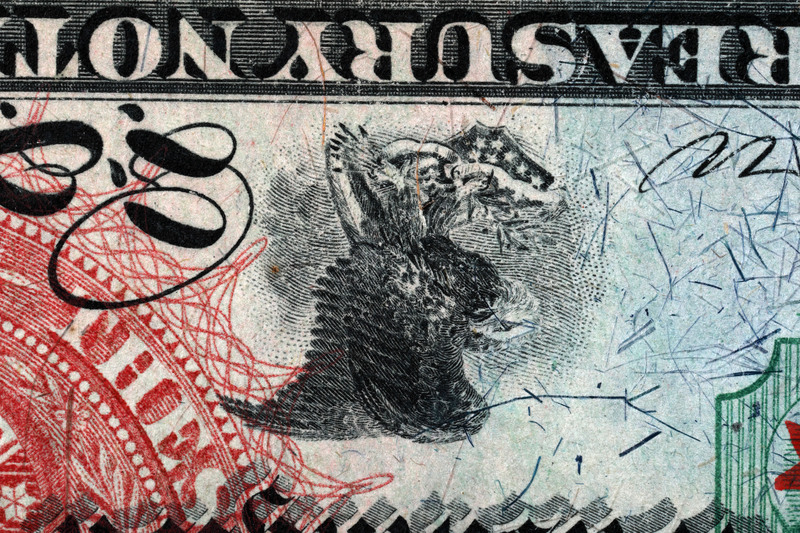 As with the figures and symbols represented on them, U.S. banknotes have sometimes gained unintended nicknames since the Treasury Department started manufacturing paper currency in 1861. This currency meant to patriotically represent our country has not always translated to the public in the way its makers intended. Often the American public has found much more amusing nicknames for these notes. So dubbed because of the striking resemblance the three zeros on the reverse bear to three watermelons, the "Grand Watermelon" note was released in 1890. The squiggly patterns on the zeros that give the "1,000" its watermelon appearance were actually meant as a deterrent to counterfeiters. In those days, the United States imposed high penalties for counterfeiting: a $1,000 fine, 15 years in prison—or both. As it turns out, officials at the Treasury found that the crowded design on the back of the note actually made it more difficult to distinguish between real and counterfeit notes, and they changed the design just one year later. First issued in 1869, the 10 dollar "Jackass" note represents another notorious nickname assigned by the public to a U.S. banknote. The elusive "Jackass" on this note can be viewed if you stare at the eagle in center of the bottom and turn it upside down. Commonly enlisted as pack animals by western settlers, the jackass, or male donkey, may represent patriotic ideals of expansion and enterprise, but that was likely not the intent of the designers in this case. Intentional or not, spenders and collectors to this day still gleefully use the nickname to describe the 10 dollar note. The "Lazy Deuce" gains its moniker from the large number "2" that appears to be lying down when looking at the note. However, there is nothing lazy about the measures the government took to prevent counterfeiting during the Civil War era. By 1865 the value of paper currencies in circulation could easily be increased by adding a zero to the end of the note. For example, a 1 or 2 dollar bill could be made into a 10 or 20 by even the most novice counterfeiters. One measure taken to prevent counterfeiting was to overlay banknotes with a horizontal number. Just as morbid as its name suggests, the "Tombstone" note is so named for the shape surrounding the portrait of Thomas A. Hendricks. Hendricks was vice president from March 4, 1885, until he died in his sleep during his term at the age of 66 on November 25, 1885. Though not explicitly stated by the Treasury, it is likely that the country was still mourning his death, and this motif was purposely incorporated into the design for the new 10 dollar bill in 1886. Typically used as a term of endearment or ridicule, nicknames weave their way into almost every facet of our lives, from presidential monikers all the way to our wallets! While not the intention of the designers, the nicknames designated to these notes shed light on some of the ways early Americans incorporated humor into their everyday lives and found common resemblances in objects as common as banknotes. Open up your wallet and wonder, maybe there is a secret nickname waiting to be coined on one of your bills. Kelsey Wiggins completed a summer 2017 internship in the National Numismatic Collection.